Exonuclease III (E. coli) is a 3' -> 5' exonuclease which acts by digesting one strand of a dsDNA duplex at a time or digesting the RNA strand of an RNA-DNA heteroduplex(1,2). Exonuclease III (E. coli) breaks phosphodiester bonds on the 5'-side of AP sites in both dsDNA and ssDNA(3). It removes 3'-terminal groups on dsDNA(3), increases MutY turnover(4), and efficiently degrades 3'-recessed but not 3' protruding DNA ends (creating 5'-overhangs)(5). 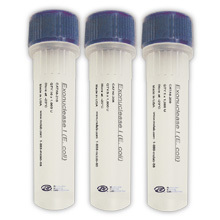 Exonuclease III (E. coli) removes a limited number of nucleotides per binding event, resulting in coordinated progressive deletions within the population of DNA molecules(1). Degrades excess single-stranded primer oligonucleotides from a reaction mixture containing double-stranded extension products. 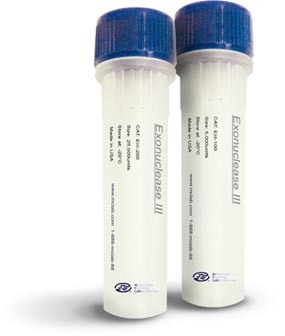 Purified from a strain of E. coli that expresses the recombinant Exonuclease III gene. One unit is defined as the amount of enzyme required to produce 1 nmol of acid-soluble total nucleotide in 30 minutes at 37°C. 1. Linn, S. M. (1982) Nucleases, pp. 291-309, Cold Spring Harbor Laboratory Press. 2. Shida, T., et al. (1996) Nucl. Acids Res. 24 (22), 4572-4576. 3. Doetsch, P. W. (1990) Mutat. Res. 236 (2-3), 173-201. 4. Pope, M. A., et al. (2002) J. Biol. Chem. 277 (25), 22605-22615. 5. Henikoff, S. (1984) Gene 28, 351-359.